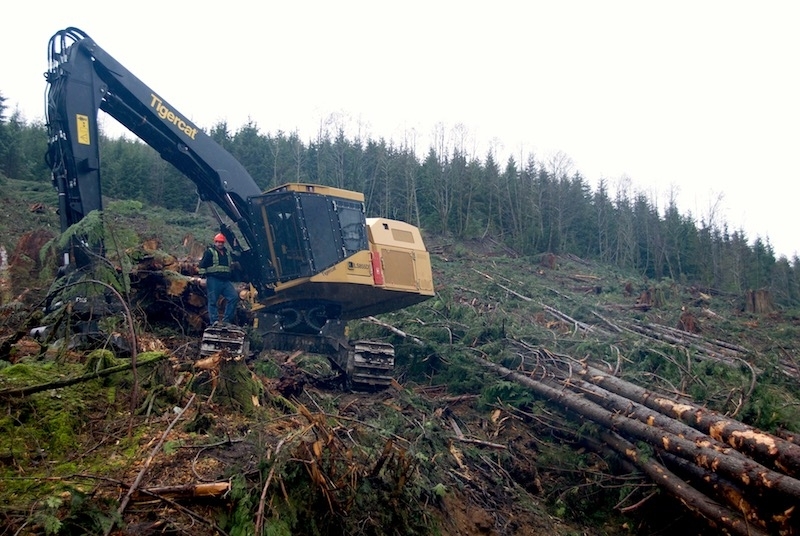 Nov. 8, 2018 – This year personal finance comparison website Finder Canada ranked logging and forestry as the most dangerous industry in the country with a dismal record of 2.8 per cent of those employed in the industry injured or killed in 2016. That fact, along with average weekly salaries of $1,109, led the website to rank the industry lowest in terms of risk of reward. These numbers prove what’s been known in the industry for many years. It’s a difficult place to work, and more difficult still to make a decent living. Yet something is keeping contractors around, and we wanted to find out what that is. In our 2018 Contractor Survey we asked what aspects of the job loggers enjoy. The results vary by location, but overall the largest portion of respondents (57%) say it’s the ability to work in the woods. In every region save for the B.C. Coast and Alberta, working in the woods was chosen as the No. 1 perk of being a logger. The second highest aspect is the variety and challenge at 40 per cent, followed closely by independence at 39 per cent. 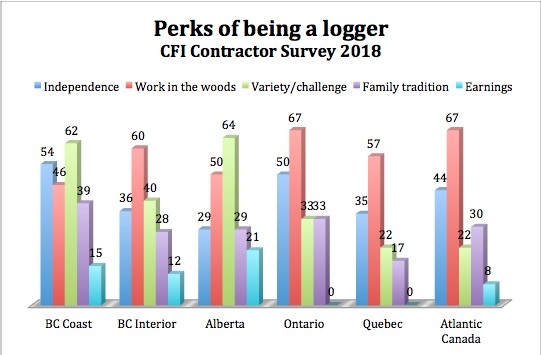 It is not surprising that financial compensation is the least likely aspect that loggers enjoy (10%), with zero respondents in Ontario and Quebec choosing that answer. Percentage of respondents who say they enjoy these perks of the job, by region. Given the financial challenges identified in the survey, it’s not surprising that 74 per cent of loggers see financial compensation as the most important part of the industry to improve in order to attract replacement contractors. 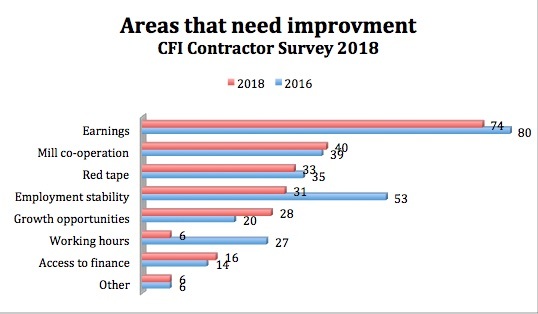 Percentage of contractors who identify these parts of the business that need improvement in order to attract replacement contractors.